So, what did I think of my first experience of New Wine? Well, it's hard to know where to begin. I suppose the first thing to talk about is the family stuff. Camping with ninety or so other St. Tees folks was really great. Sharing food and cooking with Nicola and Ruth was brilliant - they've become like the little sisters I never had - love them to bits. And having the time to sit and chat with lots of other folk, with whom I usually only have time for a brief "Hello, how are you?" as I charge around the church doing my duties, was brilliant too. Lots of new friendships made, and old ones significantly deepened. There was lots of fun and banter as well. Worshipping in a hall with 2,000 other Christians is something everyone should experience at least once in their lifetime - it's very uplifting, and you get a hint at what God and His people are capable of - and, possibly, a glimpse of heaven here on earth. I have to confess that I had mixed feelings about some aspects of the worship - I worry that some people may almost idolise certain worship leaders, and I'm concerned about how being so 'famous' affects said worship leaders. �People kept asking me who had led worship at the venues I was attending. I never had any idea, which isn't to say that I didn't appreciate their efforts, and their willingness to serve God in that ministry, but I'm just not interested in the personalities. God is the all-powerful, all-seeing, all-knowing, creator of the universe (and I think it takes a physicist really to even begin to grasp just how immense the universe is, and therefore to marvel at God's awesome power, but that's another story for another day); He is above everything, but is in everything too. �He's closer to us than we are to ourselves, but also vast and remote. �We christians are His children - by adoption! �I love God, but at the same time, I tremble at the thought of His holiness and power. The veil of the temple was torn in two (Mark 15:38, Hebrews 10:19-20) when Christ died upon the cross, symbolically enabling mankind to enter the 'holy of holies' without hindrance, so we can approach God, and talk to Him, directly, without the need for the Levitical priesthood and a lot of 'mumbo-jumbo'. �But does that mean that we have the right to be irreverent towards Him? �I think not. �But perhaps that's just me. �Perhaps I am an old fuddy-duddy. �Perhaps I'm 'hung up' on the idea of the vengeful God of the Old Testament, but on the other hand God is the same God He always was. �The only difference between 'then' and 'now' is that Jesus died on the cross as the one, perfect, sacrifice for our sins. �I am only fit to come into His presence because of the blood of Jesus. �I am a sinner, though a redeemed sinner. Therefore, I am going to stick, for the most part, to being appropriately reverent towards God, and shall, probably, always find it difficult not to cringe inwardly at the mention of 'Daddy God'. One of the things I began to learn about in a more formal way at New Wine was about being an introvert, and more particularly, about being an introvert in the context of the charismatic church. �I've been aware�for a long, long, time�that I'm an introvert, but I haven't always been comfortable with it - in fact, at one time, I wondered whether it was even possible for me, as an introvert, to be a Christian at all. So what is an introvert - and for that matter, what is an extrovert? �Why are they different, and why does it matter? An introvert is, classically, someone who 'processes' internally - i.e. they think about the world and their interaction with it, within their own 'internal world'. �They derive their energy from their internal thoughts, and become exhausted by over-much external stimulation, often resulting in them withdrawing from interaction for a period to 'recharge their batteries'. �By contrast, extroverts derive their energy from interaction with the external, and tend to 'think aloud' - throwing out seemingly random ideas. �Extroverts tend to find solitude draining. �Of course, there is a continuous 'spectrum' ranging from extreme extroversion to extreme introversion, with those in the middle sometimes referred to as 'ambiverts'. Continue reading Introvert - or Not? Beginning at the beginning... �In some ways I wish I could. �It would be nice to be able to record everything that has happened in my life since I became a Christian - and it would be a terrific way to show what God is capable of doing in someone's life. �In time, as I continue, I shall probably have to fill in some 'biographical' details, in order to make what I'm rambling about make sense to anyone who isn't currently residing inside my mind, and that may begin to reveal the miracles God has wrought in me. Even more, I wish I'd started this a couple of years ago, as I began to prepare for a new role at St. Tees, that of churchwarden. �The past couple of years have been a whirlwind of activity, of thoughts, prayers, and events. �It hasn't always been easy - although God's word doesn't tell us that life will be easy - but it has been a period of enormous blessing and huge growth in my spiritual life. �I am grateful for the prayers of so many people. 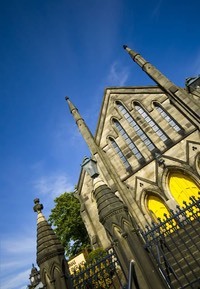 As I type this I have just returned from the 2011 New Wine Summer Conference (North and East) in Newark. �Physically, I'm tired, but emotionally and spiritually, I am on a high. Continue reading Begin at the Beginning?